According to Research and Markets survey, the market size for the beauty and personal care products will reach $716.6Bn by 2025. The reason can be attributed to a rise in the people who are ageing as well as the growing awareness among these people regarding skin care and other beauty related products and services. Apart from the awareness, the adoption of technology is also responsible for the growth in this industry. Apart from the growth in the beauty industry, we have observed some changes in the way it works. For instance, the very basic scheduling and booking appointments was a tedious job earlier. You had to plan your slot for beauty and salon services at least a week in advance. With Uber for beauty, things have changed. You can avail on-demand salon services as a result. It works in a very similar fashion to how on-demand works for the other industry niches. You choose the date and time slot, and the algorithm starts matching you with the professional. 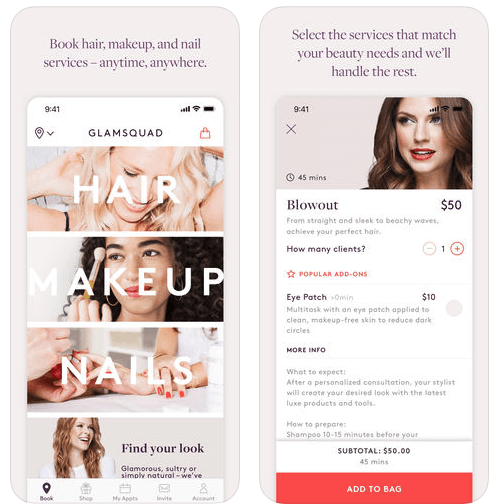 Glamsquad is one such app that offers on-demand services for the beauty and salon needs posed by the user. It fulfils the last minute salon needs you might have. The other app that seems to be popular in NewYork and other areas across the country is the bgX app. This allows you to book your last minute services. Are you also planning to develop an app for the beauty industry, which offers on-demand solutions? Here is what you need to consider, which includes the features as well as the development plan. When you are planning an on-demand beauty app, the first thing you need to consider is the features for the application. » Sign-up with information: When you are getting people to sign-up for the application, make sure you ask them questions that are relevant to your app. For instance, you want to know more about their skin type, the type of services they generally avail, the kind of facial services they have taken in the past, the frequency of the services etc. These details will help you personalize the app to match their preferences and improve your services accordingly. A questionnaire around sign-up time helps. » Make scheduling easy: The on-demand world has already made scheduling convenient. you need to ensure that the entire process is adopted when developing the app. Like any other on-demand app, allow the users to select the services available at their location at the time of their convenience. You can give the cost of the particular service at the end of their selection, and then select a personal beautician or salon specialist to perform the job for them. You can send them the details via message or WhatsApp. » Chats through the app: If there are some custom needs posed by the user or, there is a specification that they need to mention to the specialist attending to the services, the user should be able to communicate the same. This is why you need an in-app chat facility wherein the user can directly connect with the salon specialist. » Track through the app: It is important to be able to track the location of the specialist or the hair stylist through the app. The real-time tracking tells you when the specialist will reach you. It is an important consideration. » Review and ratings: the reviews and rating feature gives you an insight into the positive and negative feedbacks given to the specialist, and will help you know how good or bad they are. This is an important consideration when developing the beauty app. » Payments via different methods: The user should be able to make payments through the app for the services availed. Make sure you have integrated the various payment methods, which include wallets, credit/debit cards, net banking as well as cash at the time of service. This will help ease the payment situation for the user. » A good combination of pricing and convenience will help your users engage with your business and increase conversions. You need to make sure that they can book the beauty services just like you can book the groceries and taxis at the moment. Having factored in the convenience through the booking, you also need to factor in the price, which means you need to give them affordable and low-cost solutions to make the market competitive and increase the customer’s satisfaction. » Offer quick services that can keep up with your audience’s needs. The basic purpose of availing on-demand is to get your service needs within 30 minutes of booking it. The quicker you offer services, the better competition you offer to the market. You will need to integrate the Uber for X concept to your on-demand beauty services. » You cannot miss out on integrating online payment gateways if you want to survive competition in this industry. The idea is to make payments easy and essentially hassle-free for the audience. They should be able to choose from the multiple payment methods you have to offer, in order to complete the payment. Allow them to pay before or after the service, both online and offline. » Location is an important consideration. If you want to offer both quick and convenient services, you need to make sure they are available nearby. You should list out a range of beauty services and stylists available in the vicinity of the user’s location, and select one that matches the requirement posed. The beauty industry is striving hard to offer you both comfort and convenience at a lower price. You need to plan an app that will stand out in this niche, and help your audience engage better and get personalized solutions. If you want to invest in a beauty industry service app solution, then connect with us. We will devise solutions that match your vision and improve your profitability.